Borealis and Borouge, leading providers of innovative, value-creating plastics solutions, have developed important material solutions to address specific challenges faced by the global automotive industry. At the VDI International Congress “Plastics in Automotive Engineering” in Mannheim, Germany taking place on April 2-3, Borealis will highlight an innovative Fibremod™ solution developed for the Jaguar F-Type model in close cooperation with Dräxlmaier, the Tier One supplier. Other important product innovations in surface aesthetics will also be showcased, with focus on tiger stripe-free surfaces, moulded in colour and primerless two-layer paintability. 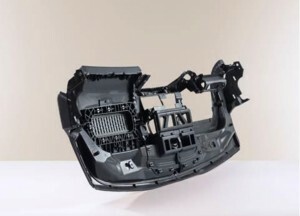 Material solutions offered by Borealis and Borouge help automotive manufacturers achieve defect-free surfaces while at the same time capitalising on the benefits of lower production and system costs as well as reduced environmental impact, by way of overall vehicle weight reduction and optimised cycle times. Working closely with the Tier One supplier, Borealis developed a dilution system based on 50% Fibremod GB601HP and 50% BE677AI, yielding a PP-LGF 30% with a well-defined performance profile for the IP carrier. This LGF-reinforced PP solution delivers the highest processing and end-use performance, while at the same time it contributes to lower weight and overall system costs. The Jaguar F-Type airbag chute is made of ready-to-use Fibremod GB303HP, a 30% LGF-reinforced PP which features excellent impact, high stiffness and optimal processing properties. The extensive R&D and technical support provided by Borealis made it possible to optimise the dilution fine-tuning process in order to fulfil specified property demands and the jointing technology of the IP carrier to the airbag chute. The Daplen EF150HP grade is the ideal successor to one of the first breakthrough moulded in colour solutions for body panels, ED230HP. Moulded in colour solutions make cost reductions possible by eliminating the number of painting cycles required.Borealis will also feature its primerless paintability systems for automotive exterior plastic applications. The company has developed and brought to market grades that boast improved and longer-lasting paint adhesion performance, optimised off-line painting cycle times, and the subsequent lessening of costs and environmental impact.